Melbourne: Speaking at Monash University, Nov 21. I will be passing through Melbourne quickly early next week. My only public event is at Monash University, but it would be great to see you there! See details below! We don't make endorsements, but beware politicians' promises about individual bus routes. Melbourne transit guru Daniel Bowen confirms that nobody is threatening to cancel the 822. The other team's plan involves removing some twists and turns on neighborhood streets, so that the route runs faster and is useful to more people. As usual, that plan asks some people to walk further to a more useful service, as virtually any access-improving network design will do. Those changes are fair game for debate, but remember: If you want to "save" every existing bus route exactly as it is, forever, then you're against almost any coherent plan and cost-effective plan to update and improve your transit network. This and this, for example, would have been impossible! Paul Mees, the Australian public transit scholar and author of Transport for Suburbia, passed away June 19 after a battle with cancer. Paul was an important voice in the struggle to bring contemporary transit planning techniques to Australia in particular. 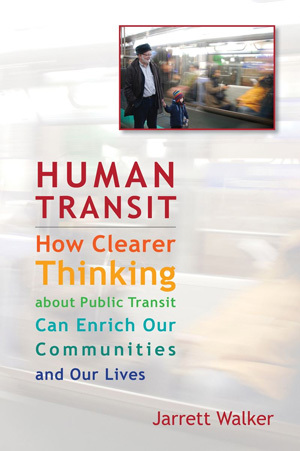 Transport for Suburbia, like much of his other writing, contains eloquent arguments for the basic geometric principles of ridership-oriented transit planning, ideas that are second nature to most transit planners but that have been extraordinarily hard to convey outside the profession. Sadly, I dealt with Paul mostly as an adversary. We had one meeting in person, in which we drove around Canberra together mostly agreeing about what needed to be done there, but Paul chose, in print, to be mostly a critic of my work. We certainly had a long-standing quarrel about the role of density in transit ridership, though I think this was mostly a problem of audience and language, not real opinion. He was certainly caustic at times, and could certainly present is ideas in ways that sounded like personal attacks. And certainly, there were reasons to be frustrated. 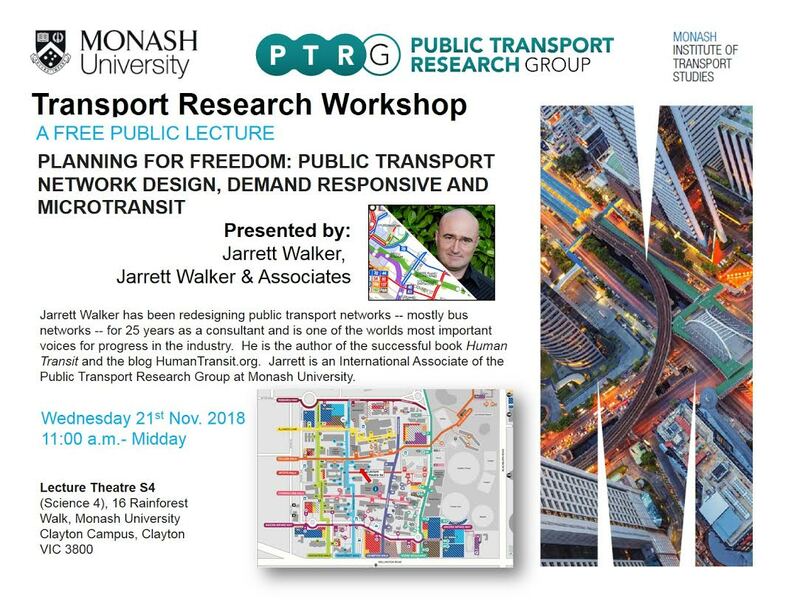 He worked in an era where the very possibility that transit could be planned as a citywide network, and that it was a crucial area of public interest and discussion, was at a low ebb in Australia, lost in the obsession with privatization and narrowly defined "benefit cost analysis". Media coverage about transit was either about infrastructure debate or about whether some service should be "privatized" or "profitable." The concept of networks — different kinds of services working together and serving an entire city — was only beginning to emerge. For years, much of the essential work of transit planning had been outsourced to operating companies that planned for their own turf, not for the network as a whole. There were few motivations to innovate, and many to suppress innovation. This was the world in which Paul and I both had to work, and I'm grateful that he lived to see some of the subsequent revolution. Australian governments are now re-asserting their right to control the design of their transit networks on behalf of the cities that depend on them so profoundly. Many of the ideas that Paul helped promote are finally surfacing and taking hold. All progress comes from a broad front of voices, and nobody hears the moderates ones unless more extreme and uncompromising ones are also present. Paul Mees was, in many ways, the uncompromising conscience of Australian transit planning. His passion and persistence on the topic will be missed. Photo: Michael Clayton-Jones, The Age. If after watching this you really want the iTunes track, then you are truly a masochist. Here's the now-viral Metro Trains Melbourne rail safety video "Dumb Ways to Die," with infernal-tune-that-you'll-never-ever-get-out-of-your-head by Tangerine Kitty. PNG. The image below is obviously illegible but the zoomed-out look shows us important things. 1. The inner north of Melbourne, immediate north of the CBD, should be a public transport paradise. It's historic, very dense and has a grid street pattern for easy walking to transit. It has frequent north-south trams on all the major streets, but it lacks the frequent crosstown services that would make a complete east-west grid for everywhere-to-everywhere travel. The routes are there, as you can see here and here , but except for the one Mr Wright draws, none are frequent enough to make adequate connections, so their role is largely symbolic. This is probably because there are too many overlapping infrequent routes, and they need to be considated into fewer stronger routes. 2. The inner east and inner north grids are poorly stitched together. There are frequent crosstown routes in both but it's hard to get from one grid to the other, except by coming almost downtown, to Hoddle Street, or going way out, to Bulleen where the blue 903 crosses. 3. Melbourne has lavished great attention for years on the four orbital Smarbuses, inverted U-shaped routes that are obvious as north-south bands across the far right of the map. What Melbourne really needed was a high-frequency grid, with crosstown (perpendicular to radial) lines concentrated in areas of high demand so that you could go from everywhere to everywhere with a simple L-shaped trip. The Smartbuses oversimplified the grid concept by insisting, for no reason I can discern and at great cost, that these services all had to be complete U shapes wrapped all the way around the city. regardless of the markets through which they pass. You can see the effect. Parts of Melbourne that could support high frequency crosstown service, like the inner north, or the Port Melbourne-St Kilda corridor, don't have much of it, while a fortune is spent on a vast outermost U (the grey line) which creates no grid effect because it lies far beyond the end of most frequent radials. It's also far, far to long to be operated reliably, as are many of the Smarbuses. The reliability can be assured only by inserting substantial break time along the way for schedule recovery, which would mean that they don't really flow continuously in the way that the route number and brand would suggest. 4. Only with a Frequent Network map like Mr. Wright's can you see Melbourne's network in a way that would help you understand it as an instrument of freedom, something that you might use for many purposes as part of am empowered life. While the State of Victoria has recently taken over public transport information, their published maps still make it very hard to see the network this way. If you arrive at the website wanting to see a real map of your transit system, and you figure out that you need to click Maps / Metropolitan Maps, you're asked to choose between train, tram, and bus. Again, the assumption is that you must be looking for a particular transit technology, and that nobody would ever be interested in simply understanding how all public transport — with the technologies working together to form a network — might be useful their lives. What's more, maps of local buses are chopped up by Local Government Area, arbitrary boundaries that slice up the map in ways that further conceal patterns of usefulness. And of course, there is no Frequent Network map, like you'll find in Brisbane, and like Mr Wright as sketched above, to help you figure out which services are coming soon and which require you to build your life around them. So if you know how to get around Melbourne freely and easily all day, bookmark Mr Wright's map. For now, it's one of Melbourne's most important bits of public transport info. The Coalition supports Infrastructure Australia (IA) and in government will strengthen its role, creating a more transparent, accountable and effective adviser on infrastructure projects. The Coalition will ensure that Infrastructure Australia has guaranteed ongoing funding. … The Coalition’s commitment means that IA will be provided with the resources necessary for it to do its job properly. It's interesting to think about why urban issues that are bipartisan in Australia seem to become Democratic concerns in the US. In both countries, most of the population lives in urban areas, but there is a crucial difference in language that creates a difference in habits of thought. Americans think of big "cities" as separate from their "suburbs," and often use these terms as shorthand or euphemism for a range of other oppositions. (Only in America, for example, would a style of music associated with black people be called "Urban.") Americans also have the idea of a suburban center (what Joel Garreau calls an "Edge City') that clings to the outer orbit of a big city but can think of itself as unrelated to it. Hence someone in Tyson's Corner, Virginia, say, may be happier thinking of their metro area as "Northern Virginia" rather than "greater Washington DC." Those word choices lead to a US political reality in which big cities — narrowly defined in exclusion of their suburbs — represent a minority of the population and thus attract the interest of only one side of the political divide. By contrast, when Australians say "Sydney" or "Melbourne" they usually mean the entire urban area — the continuous patch of lights that you see from an airplane. So people who live in what Americans would call the suburbs of Sydney think of themselves as living in Sydney. This way of speaking encourages them to accept that the problems of Sydney are their problems, whereas a resident of Tyson's Corner may feel quite removed from the problems of "Washington." When cities are understood in that inclusive way, it follows that most Australians live in cities, so naturally both sides of the political divide must care about them. 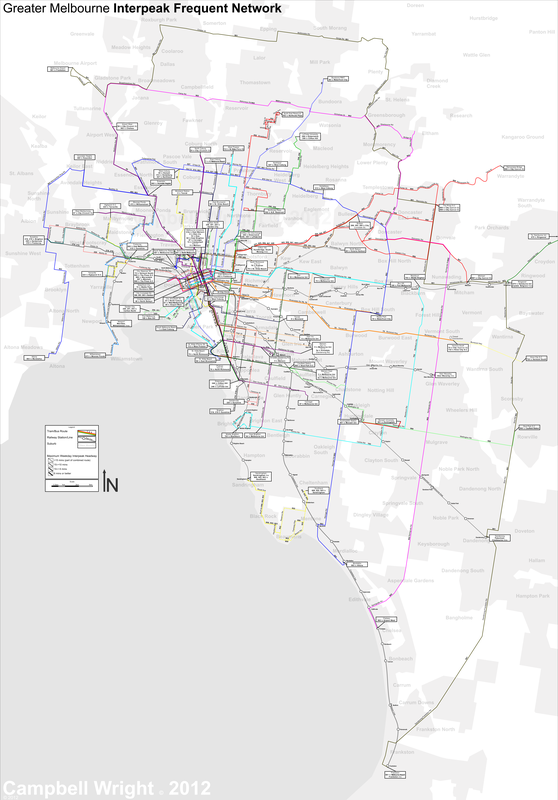 Peter Parker of Melbourne on Transit recently sketched some frequent network maps for that city, the second largest in Australia. You can find a range of efforts for various cities using the Frequent Network category. My original post arguing for the value of frequent network maps is here.